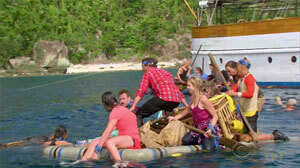 Pre-game Ep1: "The Stakes Have Been Raised" Ep2: "The Stakes Have Been Raised"
As is often done, tribes are brought in by boat, and have one minute to gather as many items as they can, then board a raft. Much splashing and tossing ensues. Ozzy swims out to retrieve a reward tool kit, eventually followed by Caleb. Ozzy releases his first, so Nuku earns tools. Meanwhile, Sierra grabs the Legacy Advantage. Filming begins, Ozzy gets tools, Sierra an Advantage. As seen in Blood vs. Water. Seven people people paddle a raft out to a platform, disembark, then one (Ozzy, Hali) swims to retrieve a key. 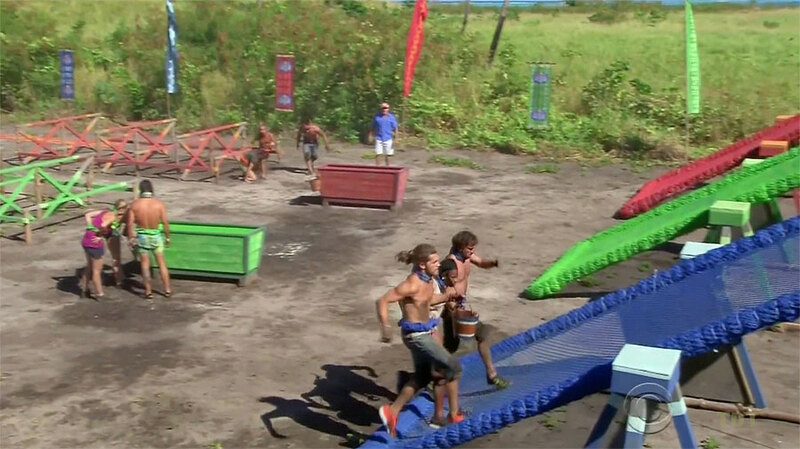 Then they all go back to the beach across an obstacle course, bringing the key with them. 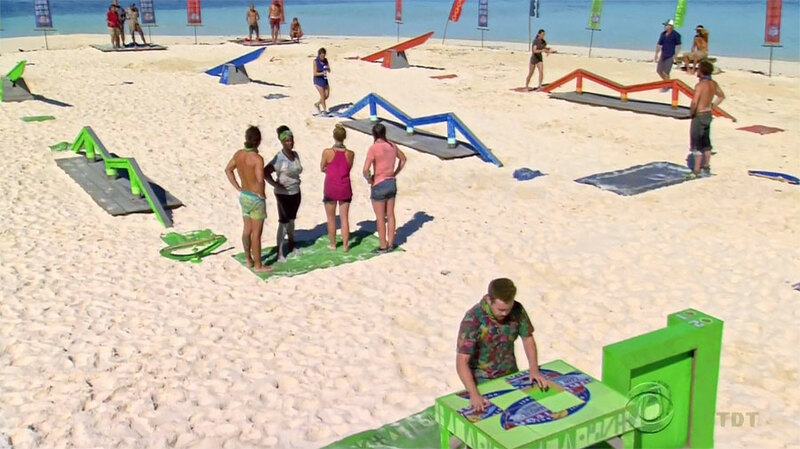 Two people at a time dig in the sand to find two bags of puzzle pieces (JT, Tai; Caleb, Malcolm find them). Then one new person (Debbie, Varner) uses key to unlock the last puzzle bag. 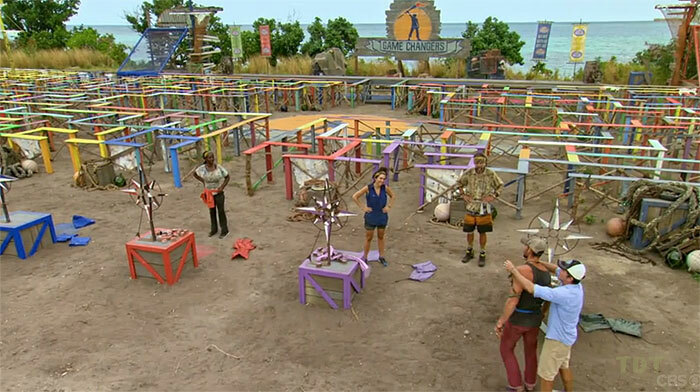 Two people (Zeke, Cirie; Ciera, Sandra) do three-stage ship's wheel puzzle. Nuku takes an early lead, Mana has trouble with the digging for bags and the puzzle. Nuku wins fairly easily. Ep1 RC/IC: "Blue Lagoon Bustle" - Nuku wins. TC1 - Ciera voted out (9-1), 19 left. 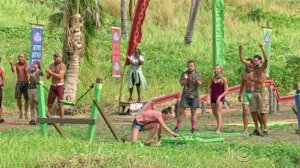 Cirie sits out. Six people race over a balance beam and swim out to cage, untie a giant 400-lb snake, lift it over the cage, carry it along the balance beam to the beach. Nuku takes an early lead. Three people (JT, Debbie, Sierra; Malcolm, Sandra, Michaela) remove number tile packets from the snake. Number tiles can unlock a combo lock. 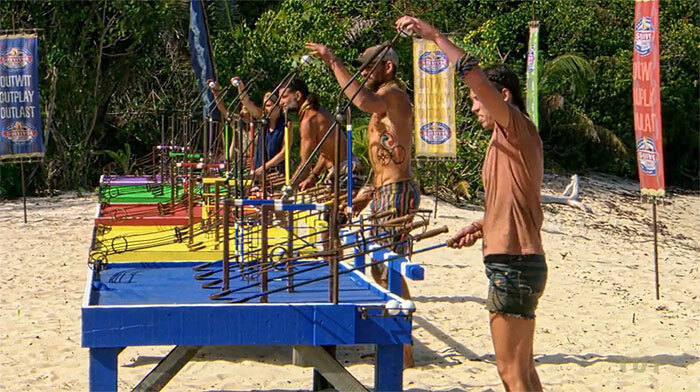 Release rings, do ring toss (Sierra, JT/Malcolm) to flip paddles and spell IMMUNITY. Nuku had a 6-paddle lead, Malcolm ties it 6-6, then JT wins it for Nuku, 8-6. Ep2 RC/IC: "Serpent Turf" - Nuku wins. TC2 - Tony voted out (7-2), 18 left. Ep3: "Survivor Jackpot" Ep4: "The Tables Have Turned" Ep5: "Dirty Deed"
Tribal swap time - Probst hands out wrapped buff packages, with separate plates for men and women, ensuring even gender divisions on each tribe. The packages contain six blue (Nuku), six red (Mana) and six green (Tavua) buffs. JT is alone on Nuku with five ex-Manas, Troyzan is alone on Tavua with five ex-Nukus, and Hali and Caleb are outnumbered 4-2 on new Mana by ex-Nukus. Tavua has to start over building a new camp, is offered no benefits. Tribal swap, three new tribes of 6 people. Three people are tied together (Michaela, JT, Malcolm; Debbie, Tai, Caleb ; Andrea, Ozzy, Sarah) and must cross an obstacle course, then gather water and fill a bucket to lower a gate. 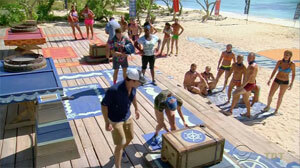 Then one person (Aubry; Troyzan; Sierra) unties puzzle board bundles. 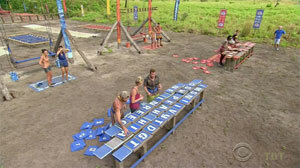 Two people (Sandra, Varner; Zeke, Cirie; Hali, Brad) work the puzzle. Nuku wins, gets a tarp plus choice of rewards (they select comfort items/blankets). Tavua is second, but initially... gets it wrong! Then a little bit later, they're actually second (receive spices). Mana is last. Ep3 RC/IC: "Austin's E.O.C." - Nuku wins, Tavua second. Previously, Troyzan found a hidden idol clue at Tavua camp, hidden in a bottle on the beach. 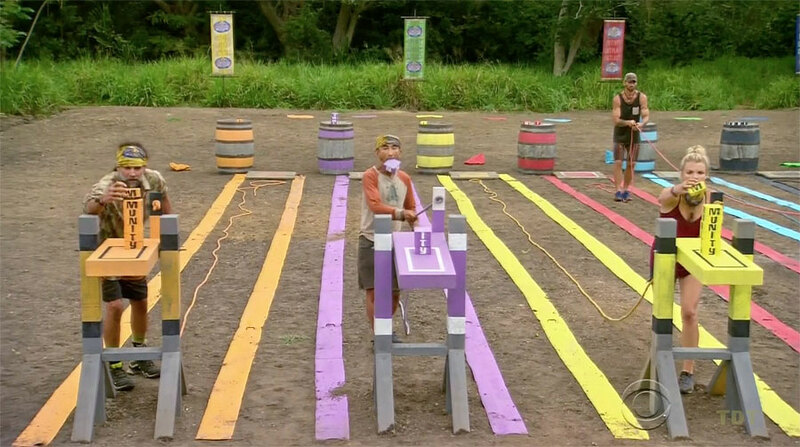 After the immunity challenge ends, Troyzan crosses to the back of the puzzle table, kneels down, and grabs the idol from under the table. He's not visibly detected. TC3 - Caleb voted out (5-1), 17 left. JT, Malcolm; Ozzy, Troyzan; Tai, Brad compete, the rest sit. One person (JT, Ozzy, Tai) must balance a cue ball on a pole, cross through a series of obstacles, adding an extra foot of pole at each of three stages. 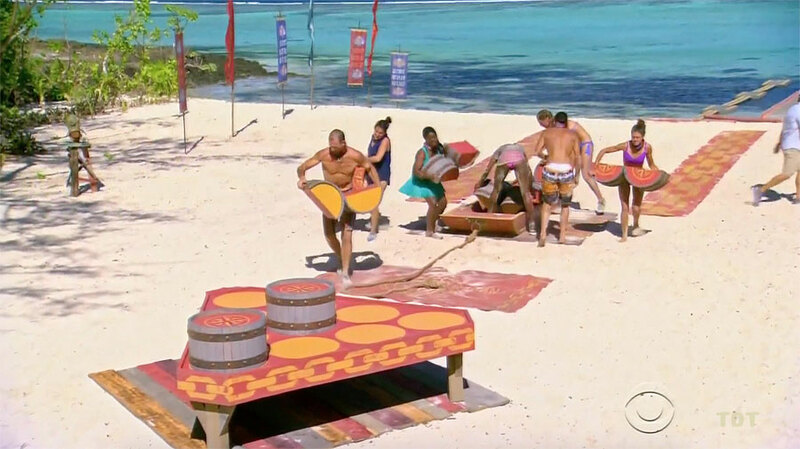 The second person (Malcolm, Troyzan, Brad) takes the ball, releases a key, unlocks sandbags, then must toss them to knock off bamboo poles. Malcolm wins for Nuku, Brad second for Mana. Nuku gets full coffee set plus cookies. Mana gets thermos of iced coffee. Ep4 RC: "Ram-Ball On" - Nuku wins, Mana second. Sandra, Troyzan sit out. Callers: Brad, Cirie, Varner. Blindfolded: JT-Michaela, Malcolm-Aubry; Andrea-Sarah, Ozzy-Zeke; Sierra-Hali, Tai-Debbie. Losing two tribes must both attend Tribal Council. Blindfolded people must gather three bags, attached to a rope that dumps a barrel full of paint/water on them. When all three are gathered, bags contain balls that must be moved through a table maze. Nuku leads early. Table mazers (ball placed): Nuku - JT (1), Michaela, Malcolm (2), Varner; Tavua - Ozzy (1), Sarah (2), Andrea (3); Mana - Sierra, Hali, Brad (1), Sierra. Andrea wins it for Tavua, Varner blows a huge lead for Nuku. Ep4 IC: "Ow Pairs" - Tavua wins. 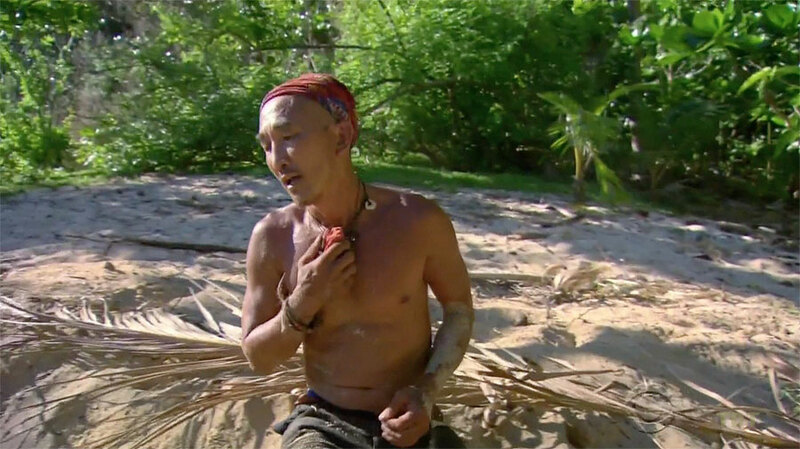 After the challenge, Mana returns to camp. Tai goes off hunting for an idol, and thinks he's found it, but it turns out to be just a clue. But it's a clue to an idol hidden at camp, which he promptly finds. 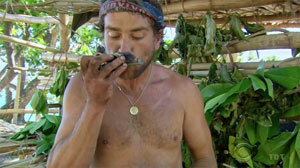 He then announces his find to the tribe, and they make plans to use it at Tribal Council. TC4 - Malcolm idoled out (-5), 16 left. Feeling in danger after Malcolm's boot, JT goes idol hunting, and discover's a clue to Nuku's idol hidden in a tree (similar to Tai's from Ep4 at Mana). JT promptly goes and digs up the idol. And that's the last time it's ever seen. Troyzan sits out. One person (Sarah, Sierra, Varner) uses a grappling hook to grab a bow. One digger (Tai, Cirie, Michaela) runs out to dig up a ball. One person (Ozzy, Hali, JT) carries the ball on the bow over a seesaw and balance beam. Next, one person (Sarah, Sierra, Varner) again uses the grappling hook to grab a handle/paddle. Then the digger (Tai, Cirie, Michaela) gets another ball. 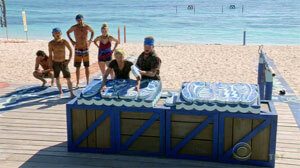 One new person (Debbie, Andrea, Aubry) carries the ball on the paddle over the obstacles. Finally, the last person (Zeke, Sandra, Brad?) works a slide puzzle. Tavua has a huge lead, Zeke wins easily. 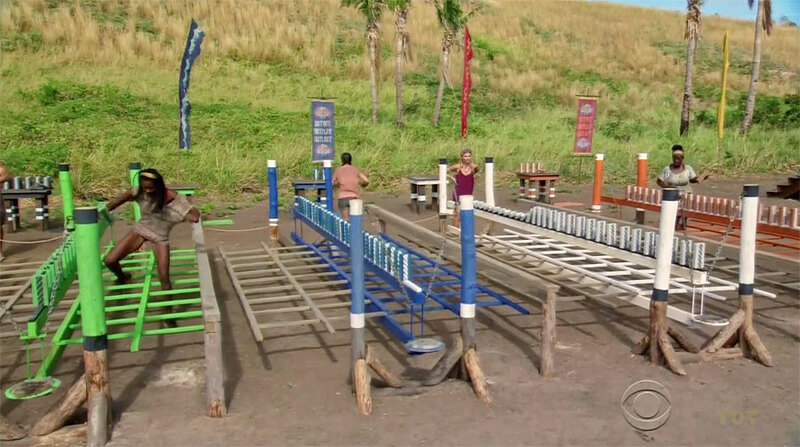 Debbie is really bad at the balance beam, Sandra finishes the puzzle for second place before Debbie crosses it. Tavua wins peanut butter and jelly, cookies and milk; Nuku gets pre-made PB&J sandwiches. Ep5 RC: "Unchained Medley" - Tavua wins, Nuku second. Tai finds Mana idol clue. Cirie sits out. 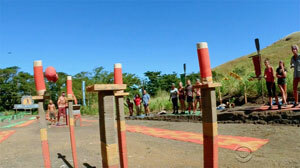 All tribe members start off behind a large wall, which they must all cross. Then three people must move a large, heavy cube under a tall post with a key ring on a spring (JT, Sarah, Sierra retrieve). The other two use the keys to unlock a crate of 100 sandb	ags. Then two people (Andrea, Ozzy; Hali, Tai; Michaela, Varner) must move all the sandbags over a balance beam. Then all take turns firing sandbags with slingshots at targets (five per tribe). Tavua has a huge lead. Targets: Tavua - Sarah(1), Ozzy(4); Mana -Sierra(2), Brad(3) ; Nuku - JT(4). Mana wins, Brad winning shot; Ozzy second, beating Nuku 5-4. 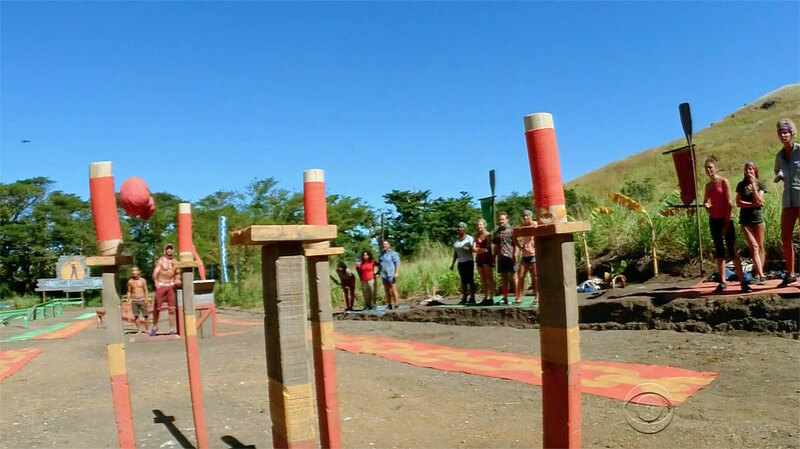 Ep5 IC: "Box Car Blues" -Mana wins, Tavua second. TC6 - J.T. voted out (3-2), 15 left. 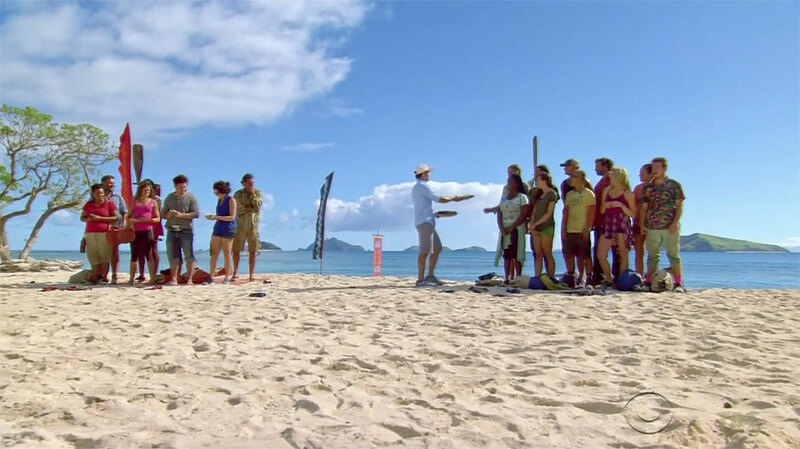 Ep6: "Vote Early, Vote Often" Ep7: "What Happened on Exile, Stays on Exile" Ep8: "There's a New Sheriff in Town"
After taking back the tribal immunity idols, Probst announces another swap. This time, seven blue buffs (Nuku) and seven red buffs (Mana) are drawn, leaving Debbie with no buff. She is sent to exile. Which, upon arriving, she discovers is a yacht, with food and bedding, and comfort. Then Cochran shows up to offer Debbie advice. Then he presents with the option to pick one of three advantages: 1. A fake idol-making kit, 2. A team advantage in the next IC, or 3. An extra vote advantage. Debbie picks the extra vote. Tribal swap, to 2 tribes; Debbie exiled w/ Cochran. Tai finds Mana's idol in the early morning of Day 14, after revealing the tribe symbol on a board of the water well, and digging underneath. Then, shortly after the swap, he uses the same method to find another at his new Nuku camp. Debbie is still on Exile Yacht, and not present, will join the losing tribe after they vote someone out at Tribal Council. 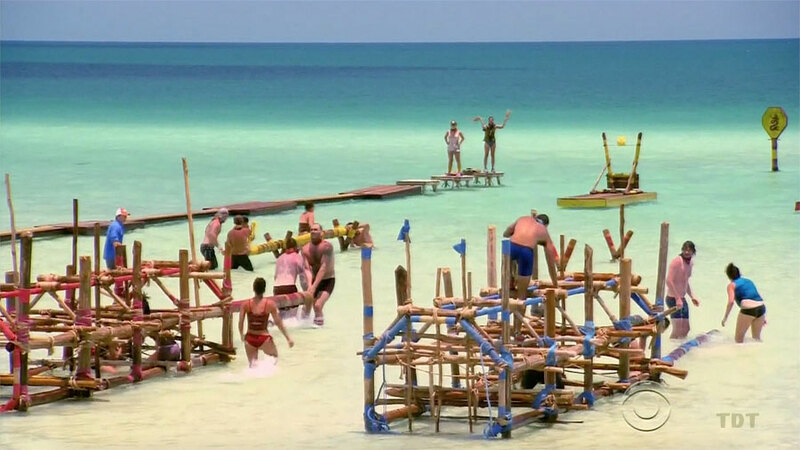 All contestants must swim out to monkey bars (with a rope to walk on), then swim to dock, load a sled with heavy puzzle pieces, haul it along the dock, then use logs to move it up an incline to a platform on the beach. Then three people (Sierra, Cirie, Aubry; Ozzy, Zeke, Sandra) do puzzle. Mana has a consistent lead, then finishes the puzzle almost immediately. Mana wins. Ep6 IC: "Cargo Salvage" - Mana wins. TC6 - Sandra voted out (5-2), 14 left. Three people per tribe (Ozzy, Andrea, Sarah; Sierra, Michaela, Hali) run around a maypole unwinding ropes to release a key. 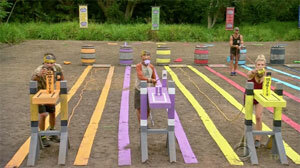 One person (Tai; Aubry) unties puzzle boards. 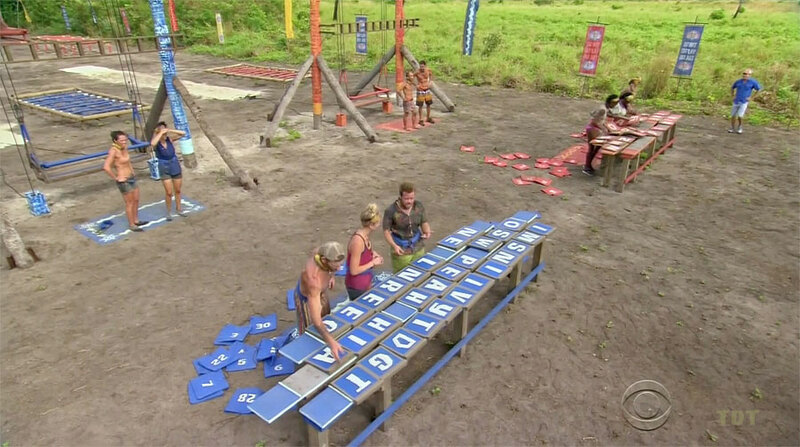 Two people (Zeke, Varner; Brad, Troyzan) do a ladder puzzle. 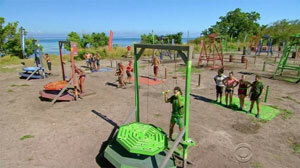 One person (Debbie; Cirie) climbs the ladder, and uses the released key to unlock a lock, releasing a ball bag. Then all squeeze through a hanging net and one person (Ozzy; Sierra/Brad) launches the balls into each of five nets with a catapult (as in Worlds Apart). Ozzy quickly gets all five balls placed, and Nuku wins 10 pizzas. Ep7 RC: "Dulcimer Stomp" - Nuku wins. 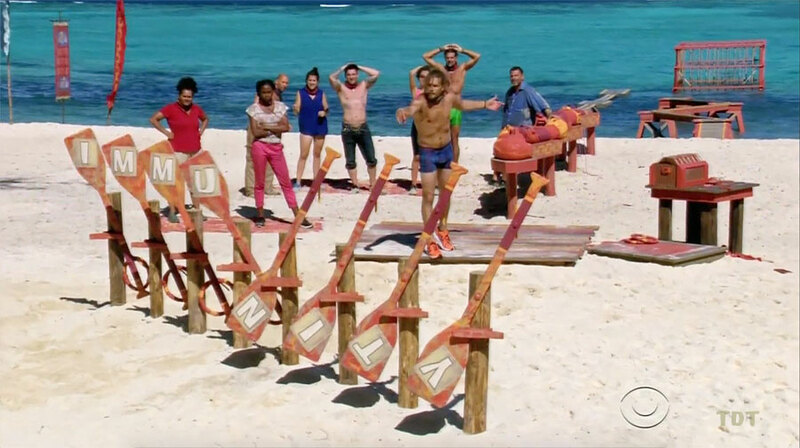 Four people (Ozzy, Tai, Zeke, Sarah; Aubry, Brad, Hali, Troyzan) swim to a raft, pull themselves to one of three markers, where one person (Ozzy, Brad/Aubry) dives down to release buoys, gather them, and put them in their raft. Once to the platform, remaining three people use buoys to spell a 14-letter word (Metamorphosis). Hali gets it for Mana, Mana wins. Ep7 IC: "Plunge, Pop, Pull" - Mana wins. TC7 - Varner voted out (6-0), 13 left. 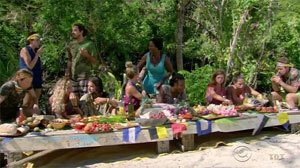 Both tribes come together, with a feast visibly waiting for them, but also Probst. He demands that, before the tribes can merge, one person from each tribe must volunteer to give up partaking in the feast. Brad and Tai reluctantly volunteer. They are given no compensation for their sacrifice. Tribes merge, Maku Maku formed. 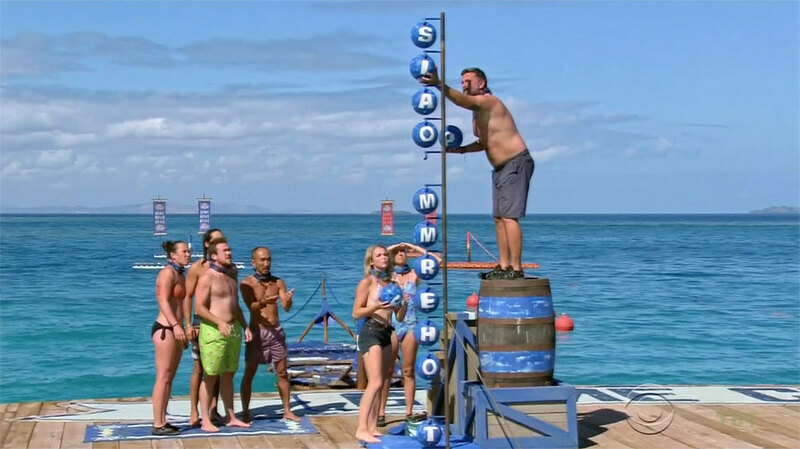 Ep8: "There's a New Sheriff in Town" Ep9: "There's a New Sheriff in Town (Pt.2)" Ep10: "A Line Drawn in Concrete" Ep11: "Re-inventing How This Game is Played"
As originally seen in Cagayan, contestants must stand on their tiptoes to keep a block of wood wedged between their head and the wooden frame they're standing on. 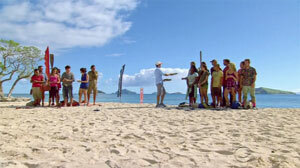 Elimination order: 13.Hali, 12.Troyzan, 11.Zeke (in seconds); 10.Cirie, 9.Debbie, 8.Michaela, 7.Ozzy, 6.Aubry, 5.Brad. 25 minute mark: 4.Sarah, 3.Sierra, 2.Tai, 1.Andrea wins!. Ep8 IC: "Keep On Your Toes" - Andrea wins. TC8 - Hali voted out (7-4-2), 12 left. Ep9 RC: "New School" - Blue team wins. 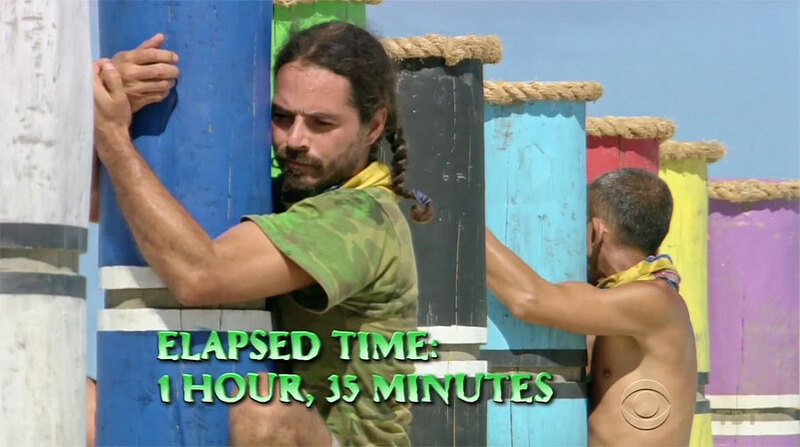 The classic Survivor endurance challenge: Hold onto a pole until you can't. 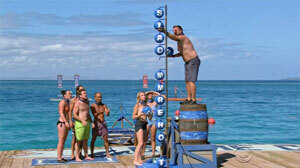 Elimination order: 12.Cirie, 11.Brad, 10.Aubry, 9.Debbie, 8.Zeke, 7.Sierra, 6.Troyzan, 5.Sarah. 20 minute mark: 4.Michaela. 40 minute mark: 3.Andrea. 1 hr, 35 minute mark: 2.Ozzy falls, and 1.Tai wins! 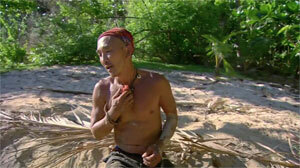 Ep9 IC: "Get A Grip" - Tai wins. TC9 - Ozzy voted out (7-4-1-1), 11 left. As seen in Worlds Apart. Brad & Cirie are captains in a schoolyard pick. Two teams: Blue = Brad, Sierra, Debbie, Aubry, Andrea; Red = Tai, Zeke, Sarah, Cirie, Troyzan. Michaela not picked, but is sitting out above an advantage she doesn't notice. 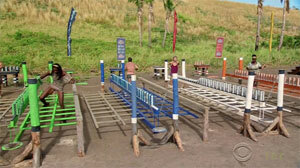 Contestants must swim, climb a ladder, go down a slide, cross a net, a balance beam, then climb onto a dock. When all five arrive, one person (Brad) dives to untie a grappling hook, then another (Sierra) uses it to retrieve five rings. Blue gets their grappling hook before Cirie even enters the course. Cirie can't climb onto the dock, so Sarah swims out to help her. Blue wins a sea plane trip to some islands and lunch or something. Cirie finishes anyway, warming everyone's hearts. Ep10 RC: "O Black Water" - Blue team wins. 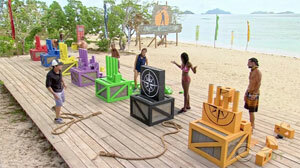 After the RC finishes, Sarah notices a "secret advantage" tied under the bench where Michaela was sitting out. Before boarding the boat, Sarah swims over, grabs the advantage, and tucks it in her shoe, somehow undetected. It's a vote steal advantage. As seen in Kaoh Rong. Contestants must pull on a rope to balance a wobbly table. One at a time, they then stack letter tiles on the table to spell IMMUNITY. 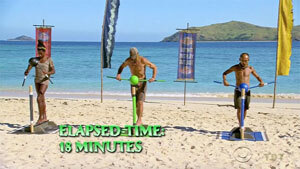 Andrea is racing Troyzan most of the challenge. Andrea drops her stack. Brad drops his. Troyzan wins! 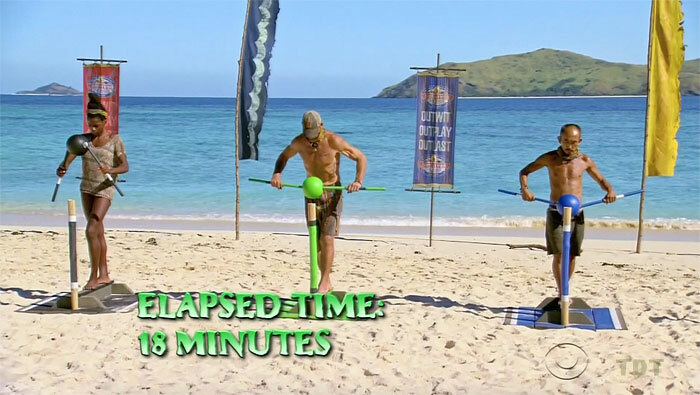 Ep10 IC: "Got a Hunch" - Troyzan wins. TC10 - Debbie voted out (6-5), 10 left. As seen in MvGX. Teams: Red = Michaela, Tai, Troyzan, Cirie, Sierra; Blue = Brad, Zeke, Sarah, Aubry, Andrea. As seen in MvGX, four people haul one person (Brad, Andrea, Sarah; Michaela, Troy, Sarah) up to get 10 bags holding letter tiles. Then use them to solve a word puzzle (Andrea, Brad, Zeke; Michaela, Cirie, Sierra). Blue team wins again, gets a resort trip for reward. Ep11 RC: "Angry Chair" - Blue team wins. Ep11: "Reinventing How This Game is Played" Ep12: "It Is Not a High Without a Low" Ep13: "Parting Is Such Sweet Sorrow"
As seen in Kaoh Rong. As seen in Kaoh Rong. Contestants must line up tiles along a board, while avoiding a trip frame. Brad drops his stack once. Andrea wins, and is the only person shown attempting to knock down the tiles. 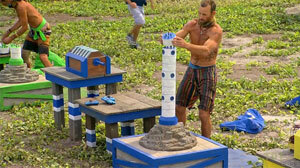 Ep11 IC: "High Step and Stack" - Andrea wins. Loved ones visit. Watching: Sarah's boyfriend, Wyatt; Andrea's mom, Linda; Aubry's sister, Carrie; Sierra's dad, Dan; Michaela's mom, Candy; Troyzan's brother, Todd; Tai's partner, Mark; Cirie's son, Jared; and of course, Monica Culpepper. Challenge performed in groups of three, tethered together: Orange (Brad, Aubry, Andrea), Green (Cirie, Troy, Sierra), Blue (Tai, Sarah, Michaela). Trios must swim, climb over an obstacle, crawl under one, squeeze under a log, unbraid a key, then knock blocks off a table with sandbags. Brad's team first through, knocks all blocks off before other teams even start throwing. 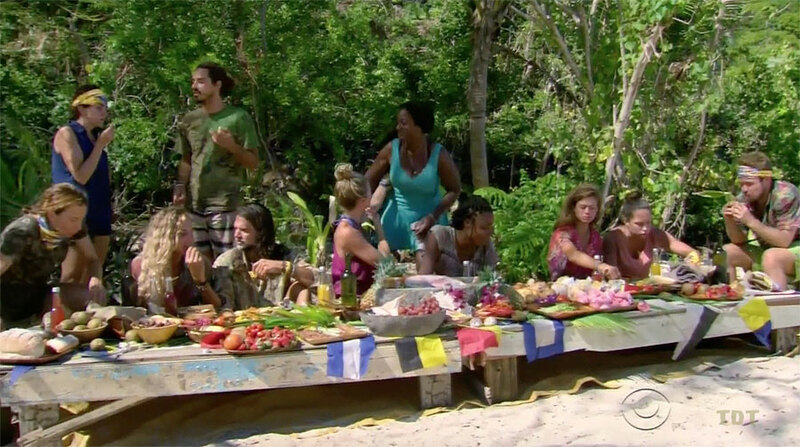 They also bring Cirie and Sarah and their loved ones on the reward feast. 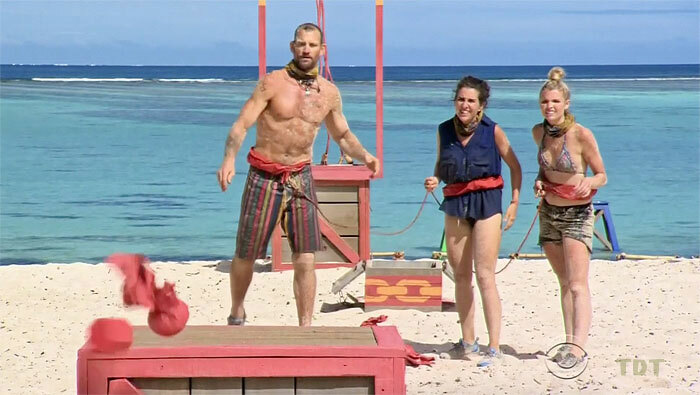 Ep12 RC: "Full Tilt Boogey" (loved ones visit) - Brad, Andrea, Aubry win. Balance on a narrow perch, holding a buoy with two sticks. Until you can't. Elimination order: 9.Aubry, 8.Sierra, 7.Andrea, 6.Sarah, 5.Cirie, 4.Troyzan. (18 minutes) 3.Michaela, 2.Tai, 1.Brad wins! Ep12 IC: "Can't Buoy Me Love" - Brad wins. 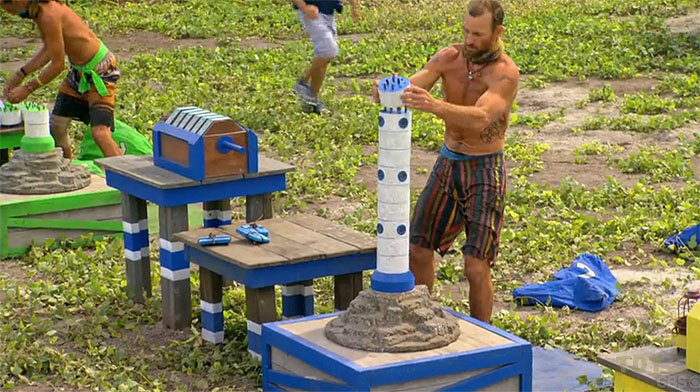 Ep13 F8 IC: "Teeter Tower" - Aubry wins. As seen in Cagayan. Stand on a pole, lower a leaky bucket into the ocean, raise it up to fill a tube and raise a key. Swim the key to the beach, unlock a puzzle, finish it. As in Cagayan F4 IC. Order heading to beach: Michaela, Troy, Aubry, Brad, Tai, Sarah, Cirie. Michaela almost has it, but wrong. Brad wins! Ep13 F7 IC: "Vertigo" - Brad wins. TC14 - Michaela voted out (4-2-1), 6 left. Contestants must race through a giant maze, to collect three puzzle bags. Once done, they must then work a 41-piece compass rose puzzle. Order: Bag3: Brad, Aubry, Cirie, Troy, Tai, Sarah. Puzzle: Brad leads, but Sarah remains close. 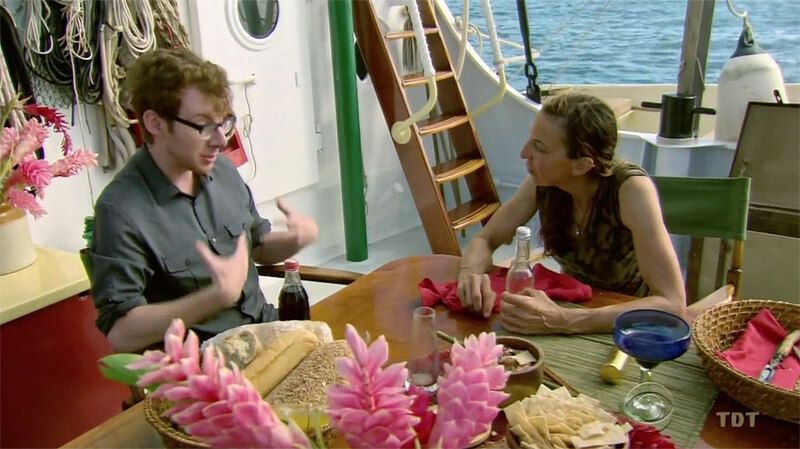 Brad wins immunity and reward (in-camp feast; brings Troy, then Sarah). Ep14 F6 IC: "Maybe I'm a Maze" - Brad wins. 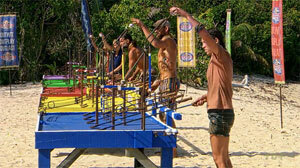 It's the same ball-and-paddle challenge that Keith used his advantage to master in San Juan del Sur. Here, Brad is the only person to place even one of the three balls, and Brad wins easily. Ep14 F5 IC: "Spoon Man" - Brad wins. 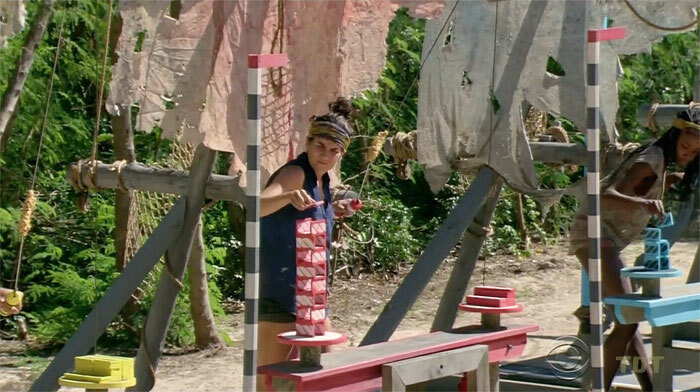 TC16 - Aubry voted out (4-1), 4 left. It's the exact same Final Four IC that Mike Holloway won in Worlds Apart. Contestants must run up stairs, untie a key, slide down a giant water slide, climb through an obstacle, use the key to unlock one of three puzzle bags, then take the bag to the puzzle stand. Once all three bags are collected, they empty them to build a lighthouse puzzle. The final piece is inside a locked chest, opened with number tiles that must be arranged to unlock a combination lock. Sarah leads through the second bag, but Brad takes the lead on the third, and blazes through the puzzle, winning easily once again. Ep14 F4 IC: "Final Four-titude" - Brad wins. TC17 - Tai voted out (3-1), 3 left. Sarah, Brad, and Troyzan field questions from the jury in a town hall-style open forum. Zeke announces he's Sarah's champion, Ozzy does the same for Brad. 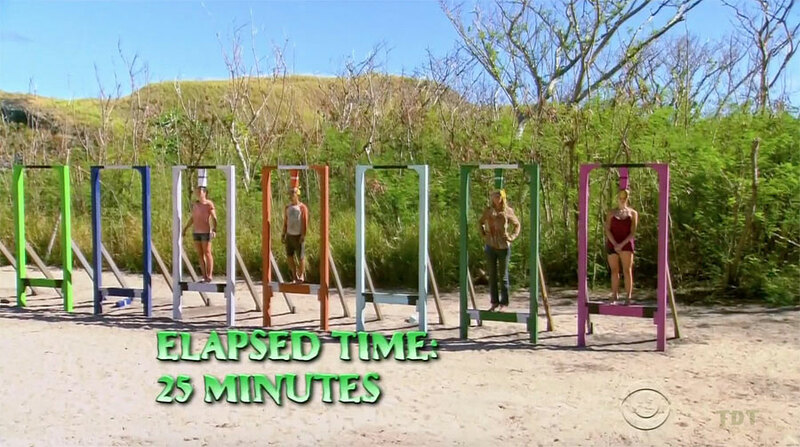 In the end, Sarah wins the jury vote over Brad and Troyzan (respectively), 7-3-0.